‘Crazy Daisy’ Photo Karen Wells. My Great Auntie Jane Finckle-Wedgeworth used to grow these in her walled garden at Chateua Higgledy at the foot of the Alps…she said in the 20’s that their shabby nature would one day be chic…oh my dearest Auntie Jane how right you were…you visionary…you oracle! 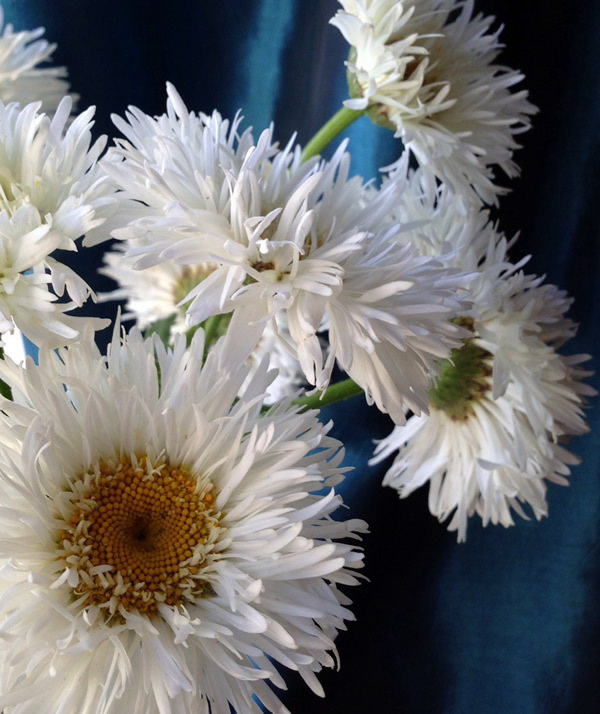 ‘Crazy Daisy‘ makes a great cut flower…solid stems and long lasting in the vase…a real trooper… albeit a slightly fluffy effeminate trooper. To be fair I have never grown them from seed myself but shall be attempting this feat in a few short weeks. So…(I know you are all on the edge of your seats…) let me tell you how I plan to grow ‘Crazy Daisy’ from seed. *The seeds need light to germinate so sow them on the surface of your seed compost with just a very slight covering of compost or vermiculite. *I shall sow some on the 20th March…. (when I’m having a big ‘sowathon)’…but you can sow them from the beginning of March until late May and then again in the Autumn. *I shall sow in module pots…and get them used to the cold before I put them outside…after the frosts have naffed off up to Iceland. *Being a hardy perennial it will come back year after year…if mine last that long I shall divide them….and spread the love….yeah baby! *She should flower from June (though don’t get too excited for the first year) but with regular dead heading she will flower away until the frosts nip her quilled loveliness. I shall of course let you know how I get on. I sell Chrysanthemum ‘Crazy Daisy’ seeds at £1.95 for 100 seeds. PS Wasn’t the horse in ‘Steptoe and Son’ called ‘Chrysanthemum’? ‘How Deep Should I Sow My Flower Seeds?’	Growing Zinnia From Seed.